As I wrote in High Country News last spring, the pumas of Southern California's Santa Monica Mountains are dying — slowly, but quite literally — for lack of genetic diversity. Blocked from migration by freeways, development and the Pacific Ocean, the lions have begun to inbreed; researchers studying the lions have, through DNA tests, found multiple instances of fathers mating with daughters. If it keeps up, the population will go sterile, depriving the tiny ecosystem of its single apex predator. That’s why it mattered so much that, last month during the government shutdown, a puma was found dead on the 101 freeway at Liberty Canyon, a well-known wildlife migration route between the Santa Monicas and open space to the north. When I blogged about that death then, several readers took the headline, “Who do you call?” to mean “who do you call to dispose of the body?” They offered advice, and even DIY techniques involving heavy gloves and netting. 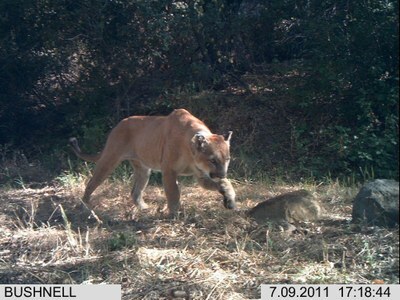 The puma known by researchers as P-12, the only puma known to have crossed successfully from open space, south into the Santa Monica Mountains. Photograph taken in July 2011, courtesy National Park Service. I appreciated that. But what I really meant was, “who do you call to understand the magnitude of the loss? Where was the puma coming from and where was it going? What did its DNA say about its ancestry?” Fewer than a dozen pumas remain in this cloistered range; every loss here hits hard. I wanted to know what this one meant. Unfortunately, there was no one around to ask. When the lion died, the National Park Service researchers who have been studying the animals for the last 11 years had been furloughed. Now that they're back, we have the answers. And it turns out this death is just about as tragic as it gets for the lions of the Santa Monica Mountains. Seth Riley, an urban wildlife expert who works on the NPS puma study, says that his colleague, Jeff Sikich, was able to access the lion's body shortly after its death and collect samples, which he submitted to genetics labs at the University of California Davis and the University of California Los Angeles. So far the UCLA lab has analyzed 15 "loci" — specific positions on chromosomes occupied by "alleles," or DNA sequences. "And of those 15 loci," Riley says, "five had alleles that we never see in the Santa Monica Mountains, and have only seen north of the 101." Had the lion not been struck and killed by a passing motorist just after midnight on October 7, that genetic material might have soon been circulating among the pumas of the Santa Monicas. The death underscores the need for some sort of safe passage wildlife could follow out of the Santa Monicas and back again at Liberty Canyon, which is "one of the only places along the 101 freeway where there's natural habitat on both sides," which is critical for animals to safely cross, Riley says. The last puma that came from the north, P-12, crossed here in early 2009, and from what Sikich observed at the site where the body was found, this recent lion seems to have made it all the way across the freeway and run up against a 10-foot right-of-way fence. Map courtesy of the National Park Service. Click to see more detail. 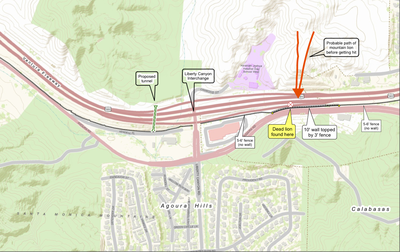 The California Department of Transportation has twice had grant applications rejected for a $10 million underpass at this site. Round three comes up soon. Riley says there's much more work to be done on the lion's DNA — scientists are hoping to test 54 loci, not just the 15 already analyzed. But it's already clear that, had he been able to establish himself in the southern mountains and breed successfully as P-12 did, the now-dead lion's impact would have been huge. "When you have a small population and not a lot of reproductive males," Riley says, "individual migration events make a big difference."